These charming rustic pourers are robust enough to be used outside with a range of materials and will enhance sand, water and muddy play. Easy to hold, they can be used to scoop and pour liquids and solids. Ideal for exploring and comparing volumes, the shaped lip makes pouring intuitive and easy for young learners. 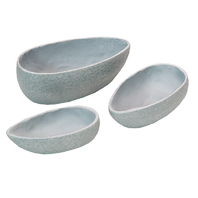 Set includes 3 tactile pourers measuring between 4 and 6 inches.